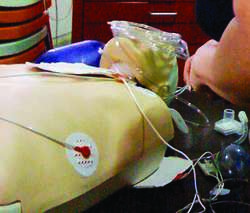 emergency medical procedures in which basic life support efforts of cardiopulmonary resuscitation are augmented by establishment of an IV fluid line, possible defibrillation, drug administration, control of cardiac arrhythmias, endotracheal intubation, and use of ventilation equipment. A constellation of clinical interventions for the urgent treatment of cardiac arrest, stroke and other life-threatening medical (non-traumatic) emergencies, which are beyond basic life-support skills and knowledge. ACLS entails airway management, accessing veins, interpretation of ECG/EKGs, application of emergency pharmacology and early defibrillation with automated external defibrillators. Definitive emergency medical care that includes defibrillation, airway management, and use of drugs and medications. Usually begun by emergency medical technicians who do intubation and defibrillation at the direction of a doctor or nurse. Continues through various modalities until the patient arrives at the trauma center. A training course in resuscitation techniques for health care providers offered by the American Heart Association. See: life support for illus. Advanced cardiac life support training improves long-term survival from in-hospital cardiac arrest. For most physicians, the algorithm approach contained in the American Heart Association's advanced cardiac life support textbook provides the key clinical information. The information is primarily in text form, with some charts that summarize large bodies of information, such as pharmaceutical comparisons and algorithms for advanced cardiac life support protocols. Shall be compatible with the American Heart Association Standards for Advanced Cardiac Life Support, Basic Life Support, and Pediatric Life Support. 8221; Both have Advanced Cardiac Life Support certification, and are proud of their zero life-threatening emergency record on the thousands of procedures they have performed. Some of the topics addressed include advanced cardiac life support, chest X-ray interpretation, abdominal pain, acid-base disorders, cellulitis, infectious arthritis, and alcohol withdrawal. The Advanced Cardiac Life Support (ACLS) manual, warns all medical personnel to simply assume "wide-complex tachycardia" and "wide-QRS" that is tachycardia that may be ventricular or supraventricular is, in fact, ventricular tachycardia. Hall, who is now an emergency medicine resident at the University of Texas, Dallas, suggested that opportunities to improve training may include expanded trauma care, electives in such areas as advanced cardiac life support, and enhanced contact with emergency medicine personnel. The outcome for cardiac arrest depends on rapid application of basic life support, rapid defibrillation, and rapid advanced cardiac life support (ACLS). She is certified in basic life support and advanced cardiac life support. The Proposed Solution Shall Provide The Division Of Fire With Als And Bls Monitoring/defibrillation Capability Compatible With The American Heart Association%s Standards For Advanced Cardiac Life Support, Basic Cardiac Life Support And Pediatric Advanced Life Support Based On The Current Standard At Time Of Delivery. Advanced Cardiac Life Support, also known as ACLS, is an important skill that needs to be learned by all healthcare professionals and emergency responders.